Weekend photographers who used polarizing filters in the days of film (remember waiting for the one hour D&P shop for your prints) have strangely seemed to avoid this filter for their digital cameras, especially DSLR’s. Whilst there are no polarizer advantages unique to digital cameras, digital cameras with limited dynamic range can benefit greatly from the selective suppression of excess contrast. Due to the limited UV sensitivity found in most digital cameras, polarizers also work well for haze control, especially with the haze we have in Thailand, thank you Malaysian forests! Quality polarizing filters are different from most others in the fact that they are made up of two distinct elements. There is an outer ring that rotates the outer “glass” relative to the inner element. This increases or reduces the degree of polarization to allow the photographer an endless range of polarized effects from one filter. 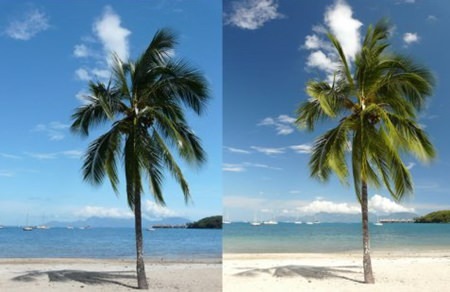 The principal behind these filters is to remove reflections, and funnily enough it is reflections that take the color out of color photography. Look at the surface of a swimming pool, for example – a shiny white, non-transparent surface. Now look through a polarizing filter and you can see right down to the tiles on the bottom of the pool. And the people frolicking in the pool! What you have to understand now is that these filters remove reflections from any surface, not just water. The reason you cannot see through some normally transparent windows is because of reflected images on the surface of the glass. The reason some tree leaves appear to lose their color is through reflected light from the sky above. One of the traps for young photographers is that because you know the grass is green, you see it as green when you look through the camera viewfinder – even though it is not truly well saturated green. Look again at the scene in the viewfinder. The green grass is really a mixture of green and silvery reflections, dark shadows and pale green shoots. Put the polarizing filter on the lens and slowly rotate the outer ring. Suddenly the silvery reflections disappear and become a deep, solid green color. The grass is now made up of green, dark green and pale green. This green will really leap out at you and smack you fair between the eyes! Your next beach scene when taken with a polarizer will really amaze you. Again, slowly rotate the outer ring on the polarizer. Look critically through the viewfinder and you will see the sky take on a much deeper color to highlight the white clouds. Keep turning that outer ring and the sea will change to a deep blue to green luminescent hue. The end result is at your command. Try taking the same shot this weekend, but with varying degrees of polarization and see the differences in the final shots. So, if the polarizer is such a wonderful bit of gear, why do we not make it a standard piece of equipment on all cameras? Well, like everything, there is a downside as well as the upside. In the case of the polarizer it does its bit of brilliance at the expense of the amount of light that gets through to the lens. With most polarizing filters you will lose about one and a half stops of light. What this means is that the shutter speed will be at least twice as long to record the same scene, or that the aperture will have to be twice the size. This means that you are more likely to get camera shake effects and suffer from lack of depth of field when using the polarizer. However, with shots in the bright sun, a polarizer will bring a new dimension to your shots. By the way, when using any filter on your camera, I suggest you use a stepping ring to increase the diameter of the filter, so there are no unwanted vignetting effects, especially with wide angle settings. My regular camera has a 55 mm diameter lens, which I have then stepped up to 62 mm so takes all my old filters. This is really a good idea and also cuts down the number of lens adapters you will need. Including the polarizer.